So today we say farewell to the first two titles on the list, the two titles in the SOE lineup aimed at kids. As you can see from the quote at the top of the post, it seems unlikely that SOE will try that focus again. So goes the myth of the kid with daddy’s credit card that was so popular some time back. It turns out that they don’t spend money. Oh, and they are mean to each other. I guess that fits the stereotype that WoW problem players are all 13 year olds, though I would not discount the 18-24 year old demographic when it comes to excelling at obnoxious behavior. Star Wars: Clone Wars Adventures seems like a natural for closure. It was tied in with a TV series that has since ended… sort of… Netflix might revive it. But as a game, it struck me as little more than a shared lobby for mini-games in the hour or so I spent on it on quiet Sunday afternoon. A vehicle for selling Jedi hats. I am sure some will miss it, but it never seemed to me to be a high point in the history of SOE. More like a bone thrown them by Lucas because they were yanking the Star Wars Galaxies license just before Star Wars: The Old Republic went live. I hope SOE made some money from it to fund other things, though I doubt they would be closing it if it was bringing in a lot of money. Still, SOE gave people their fill of Jedi hats during the last days of the title. As previously announced, we wanted to remind you that game services for Clone Wars Adventures will be discontinued the evening of March 31, 2014. We have had many incredible experiences with you in the game – from insane battles to unbelievable memories – and we thank you for all of the great adventures and support over the years. On Tuesday, March 18th, most items in the Clone Wars Adventures Marketplace will be reduced to 1 SC each for you to enjoy over the last couple of weeks. For more details, information and FAQ, please visit SOE Customer Service. Out in style I suppose. And then there is Free Realms. This was the big experiment. This was the high quality, family focused, designed as free to play from day one experiment. A lot of people were excited about Free Realms. Even the “What is Free Realms?” marketing blurb sounds exciting. 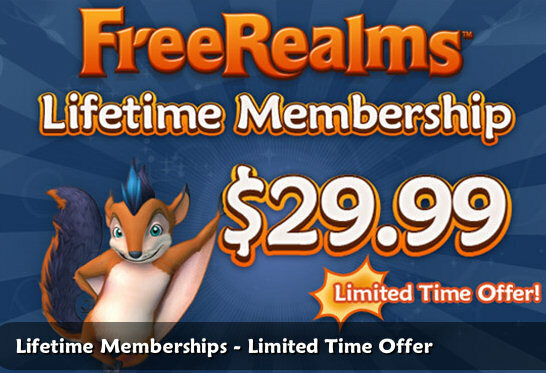 Free Realms is a free 3D virtual world where you can do whatever you want, whenever you want! Jump in straight from your web browser! Once you create your character, you’ll be in and playing in just a few minutes. Decorate your house, then invite your friends over for a party! Teach your pet a new trick or dress them up in a sweet costume! Battle enemies as you search for lost treasure or duel other players, mine for gold, cook up a meal, or race your car! When you’re ready for a different kind of challenge, play a wide variety of fun minigames, jump into the trading card game or check up with your friends on your profile page. Free Realms is the place to join up with your friends to discover, explore, compete, chat, share achievements and just have fun! In Free Realms, YOU RULE. YOU RULE, until the bank forecloses. The game ran into its own “gotta pay the bills” problems not to far into its life, and the velvet ropes vision that Smed put out there had to grow more restrictive in order to shake some coins out of the players. I am sure that SOE’s problems with Station Cash and “triple Station Cash” offers did not help. And when they were offering lifetime subscriptions for just $30, I suppose that was a sign that the cow wasn’t giving enough milk. Still, Free Realms was interesting. (I think Tipa kept track of it best.) It came out on multiple platforms, starting on Windows and then moving to Mac OS and then eventually to the PlayStation 3. Amusingly, while PlayStation support was announced early on, the Mac OS version came out first. My daughter played it on the Mac, though support for the game was a bit spotty. After the third time SOE support responded to a problem with “delete everything and install from scratch” we decided that maybe it was time to move on. We also tried it on the PlayStation, but since you cannot share accounts, that meant that anything my daughter had was gone. So that did not gain much traction. It also seemed a much deeper title than its Star Wars stable mate, which probably made it just that much more expensive to maintain. And then there is the engine problem. SOE seemed to be all over the map developing games on different engines, which leads to support and maintenance issues over time. We have seen with the whole Landmark and EverQuest Next thing that SOE is moving towards consolidation. There were no cost reduced hats to celebrate the end of days in Free Realms. The last producer’s note was from back at the closure announcement. Usually I’m in here telling you about cool new developments in the Realms. Today is a much different day for me. I’m deeply saddened to announce that we will sunset Free Realms on March 31, 2014. Free Realms has truly been a labor of love for SOE (even our own president’s kids are huge fans and active players of the game!). In a nutshell, the game has reached a stage in its life cycle where players are growing up and moving on to other games. When we first released the game in 2009, it was one of the very first free-to-play MMO for kids and teens, and we couldn’t be prouder of everything we have accomplished together in the game. While today’s news might be a disappointment, we’re sincerely excited about what’s to come for the game before we say goodbye, including player celebration in-game events and more! We will share details on the upcoming activities and sunset soon, but we wanted to give you plenty of notice so you can truly enjoy your remaining time left in the game. We thank you for all of the memories we have made together in the Realms! And so the end of Free Realms will be marked. As for kids MMOs, Smed might have a point. While Club Penguin still abides, and WebKinz continues to shift its model away from real world toys into virtual world goods, other online titles aimed at kids have faded as well. Gone are Toontown Online, Pirates of the Caribbean Online, and Fusion Fall. It isn’t an easy market and it competes with a lot of other entertainment options for kids. And then there is free to play in general, which one of the original Free Realms team was talking about recently. So today is the day. And the clock keeps on ticking down for Vanguard and Wizardry Online. This entry was posted in entertainment, Sony Online Entertainment and tagged Free Realms, MMO Closure, Star Wars: Clone Wars Adventures, The Clone Wars on March 31, 2014 by Wilhelm Arcturus. Meanwhile, Wizard 101 and Pirate 101 are still growing. At least, last I read about them, a couple of weeks ago. Maybe they will also collapse when their audience grows out of them, though. I like them, but I’m not their core audience. @Tesh – And I forgot all about them. I even see them advertised on Nickelodeon when we’re watching something silly like Adventure Time or The Regular Show… or, I must admit, Uncle Grandpa. But I only watch that for the Giant Realistic Flying Tiger. I think there are 2 main factors here. First, kids don’t work and need to be subsidized. There’s only so much parents are willing to fork out and once a kid hits a wall that they can’t climb, they move onto something else. Second, kids grow up. There are only so many “bronies”. Compared to “adult” MMOs, with very long attention spans, kids’ games are very time sensitive. What’s cool at 13 isn’t cool at 14. So I guess the point is, kids need to work at a younger age to support their addictions. I don’t know if that came out right. A real AAA Pokemon MMO from Nintendo would be the WoW of kids MMOs, obliterating all competition both current and for the foreseeable future. Free Realms was a lot of fun. I played it a fair bit, on and off. It was a “proper” MMO if you wanted it to be, with questing and monsters and combat and crafting and all the trimmings. Or you could just teach your cat to do backflips while dancing to someone’s boombox at the beach. I did both. As for W101 (and probably P101, although I never got going on that one) it may be marketed as a kids’ MMO but it’s actually a better match for all those bitter vets who wish it was still 1999. When was playing, the first, free, zone was indeed packed to bursting with excited children but after that they became progressively thinner on the ground, replaced by grim-faced, determined MMO addicts grinding their way up The Spiral. Tipa, again, has the best account. She got much further than we did. We bowed out at the beginning of Dragonspyre, when we realized even a trash fight was going to take most of the evening. My two cents is that they are gone because they were just not very good games, not because they were kid oriented. Not only are Wizard and Pirate 101 (and Club Penguin) doing just fine (as others have pointed out), but Animal Jam (where my kids reside) is also doing well. At multiple points in the last couple of years, when my kids had to decide what game they wanted to play, those games trumped Free Realms and CWA every time. So I also don’t think its a matter of kids not spending their (or their parents) money.